What happens when you take six interior designers, six furniture makers, and six art galleries, match them up, and let their creative talents mix and mingle? The Center for Furniture Craftsmanship decided to find out. 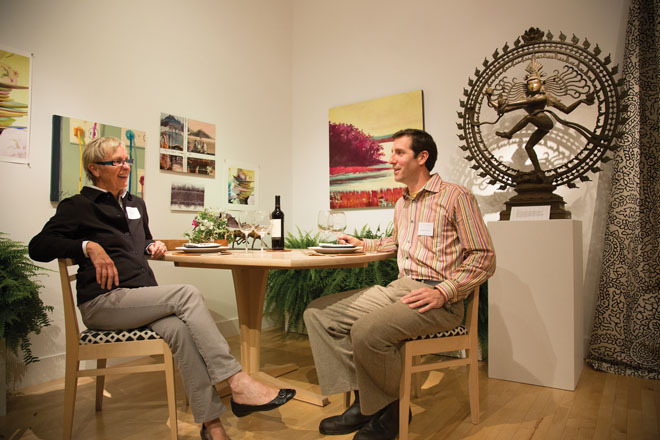 On a Friday in September, the Messler Gallery at the Center for Furniture Craftsmanship opened its doors to a first-of-its-kind exhibition. 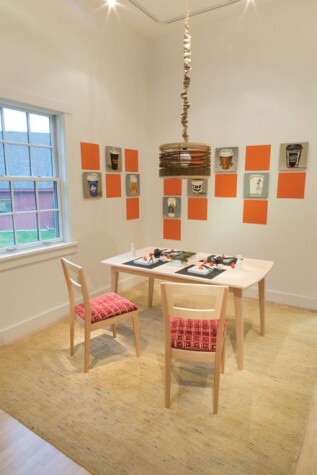 Setting the Table showcases the collaborative efforts of six furniture makers, six designers, and six art galleries—along with a handful of Maine craftspeople and artisans. Each of the six groups were given a challenge: come up with a beautiful tableaux, complete with table and chairs, artwork, and accessories. Their responses to this assignment ranged from the contemporary to the traditional, with both literal and figurative interpretations. 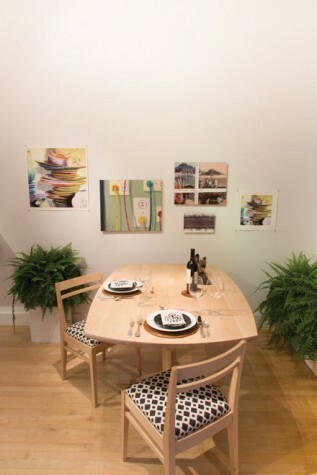 Here is a look at the exhibition and a glimpse into what the designers and furniture makers were thinking as they set their tables. James Light’s first thought for the exhibition, of course, was to set the table for a meal. 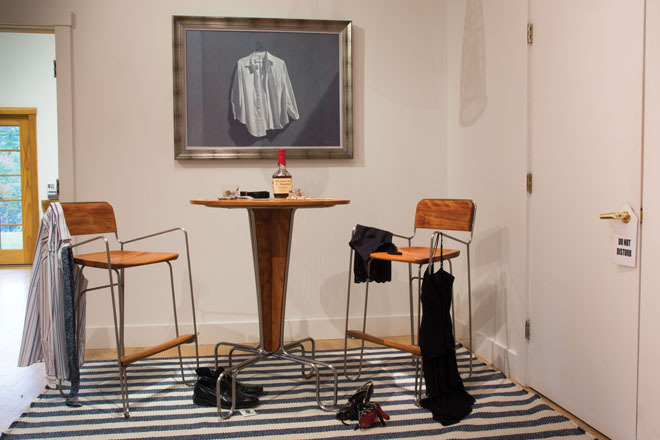 “Then I contemplated the fact that my assigned table and chairs consisted of a bar high-top and stools,” he says, “so I thought about appetizers and wine.” Then it occurred to Light that he didn’t have to create an invitation to sit at the table at all, but could let the viewer be witness to a narrative. So he decided to get adventurous. “I liked the playfulness of the strip-poker scene and the slight tension that it produces,” he says. 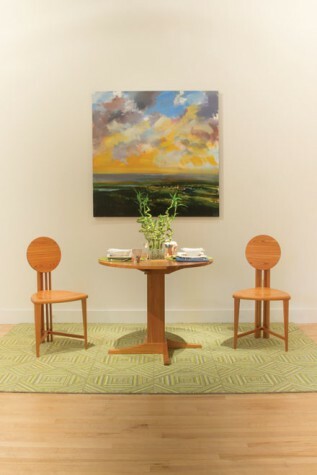 Furniture maker Eric Ritter’s table and chairs from his Morphology Series are just as suitable for a dinner party for two as they are for a cocktail party. “This set is meant for ‘somewhere in between,'” says Ritter. 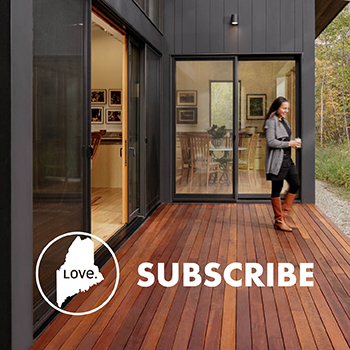 Designer: Brett Johnson, Maine Street Design Co. Designer Brett Johnson chose to embrace the Asian modern feeling invoked in furniture maker Kevin Rodel’s work by setting the table with Japanese-inspired dinnerware by local pottery artist Jason Mowery. “The metal crane pieces are, for me, representative of paper cranes, which are so prevalent in Japan,” he says. The common accent throughout is red, punctuated in both the dishes and the fabrics, as well as in Holly Ready’s beautiful painted landscape. “The whole feeling is one of a warm welcome in an intimate setting,” says Johnson. 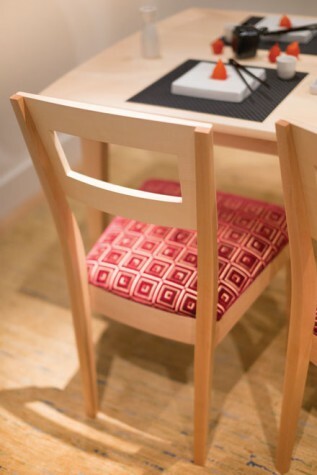 Rodel’s dramatic high-back chairs are a slight variation on the 1904 Ingram Street chair design of Charles Rennie Mackintosh of Glasgow. “Mackintosh has been a deep well of inspiration for my work for over 20 years,” says Rodel. 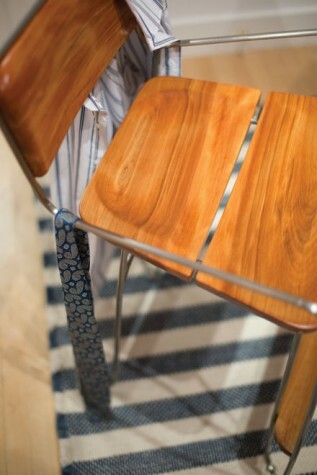 “I find his designs to be perpetually modern. 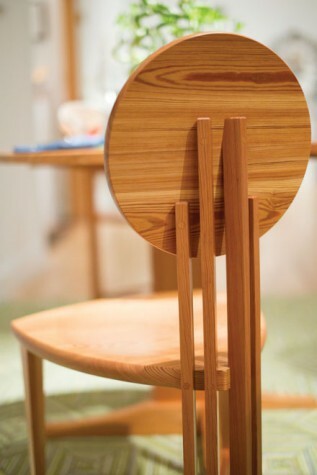 My only change was to add a curve to the center back slats, thereby adding a small degree of slant to the back, allowing this chair to conform to contemporary standards of seating comfort.” Rodel’s table was strongly inspired by the designs of Josef Hoffmann of Vienna as well as Japanese decorative design. “The idea for the open-grid pedestal comes very much from Hoffmann’s silver/metal designs, while the ‘pinwheel’ construction of the top with its open center square is a typical form for Japanese hibachi tables,” explains Rodel. 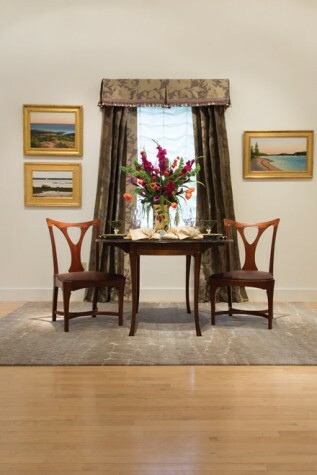 Chair fabric – Villa Romo Kirby, available through Maine Street Design Co.
Irish linen napkins – Ulster Linen, available through Maine Street Design Co.
Louise Hurlbutt’s inspiration for the exhibition began after seeing images of a table and chairs by furniture designer Gregg Lipton. 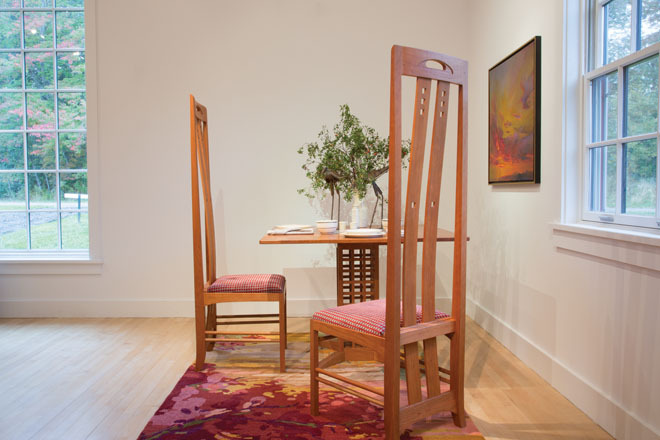 The table is modern and earthy, and the chairs are made of longleaf heart pine. “I wanted to continue this theme with a choice of tableware from Villeroy and Boch, a European company with many contemporary designs. I found the NewWave dishes with delightful bird and nature designs and paired them with a complementary Dash and Albert cotton rug in green-toned geometric,” says Hurlbutt. In collaboration with Maine Art Paintings and Sculpture, Hurlbutt picked out a painting by Craig Mooney that subtly gathers each piece into a whole. 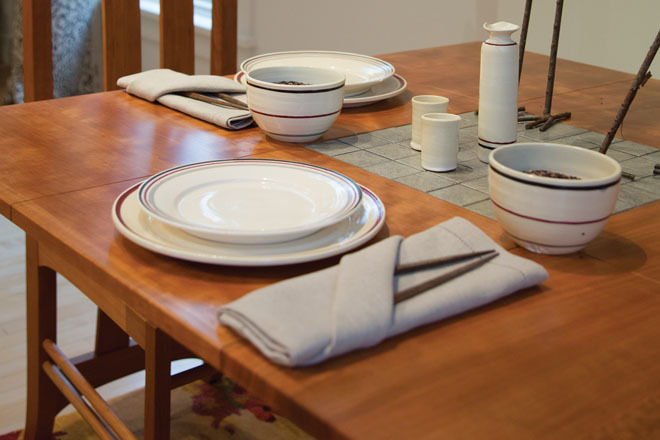 The oil on stretched canvas in bold tones complements the tableware. 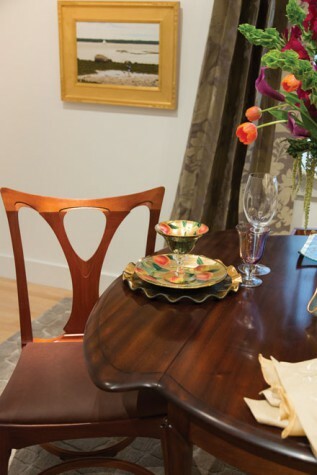 Melissa from Fleurant in Kennebunk created a sustainable centerpiece for the center inlay of Lipton’s table. The beautiful spiral bamboo arrangement set in glass marbles tops off the vibrant new-fashioned table setting.